President Trump announces massive cuts to NASA budget. Washington, DC—Due to recent Presidential budget cuts, NASA announced that they would begin to sell off their collection of moonrocks from the Apollo Missions. This will be done via silent auctions on the agency’s website in hopes that the proceeds will fund upcoming NASA missions such as the proposed manned-mission to the sun, as well as the mission to build an intergalactic McDonald’s on Titan, the largest of Saturn’s moons. 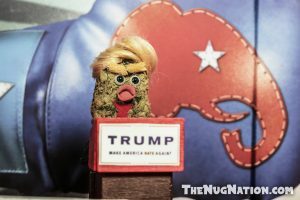 The news quickly spread panic in the small mountain town of Nugville, Colorado when residents interpreted the announcement to mean that many of their dankest residents, also dubbed “moonrocks,” would be sold into slavery. Moonrocks make up a small minority of Nugville residents and represent a historically marginalized group. While it has been explained slowly and repeatedly to many Nugville residents that NASA does not intend to enslave their population, Nugville has nevertheless experienced protests, rioting, looting and large outbreaks of choreographed dance numbers in the days since the announcement. 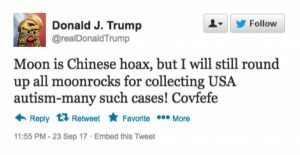 Adding to this confusion is the poorly-worded, late night tweet that President Trump posted recently, wherein he appears to indicate that he will be purchasing the moonrocks for his personal collection. President Trump tweet terrifies residents. The chaos in Nugville seems to be just beginning as various pitchfork-wielding flashmobs have descended on the capitol building, marching in unison to the steps of “Thriller.” The Nugville Gazette will continue to report on this ongoing crisis, so stay tuned for more information as it becomes available.